Chronic periodontitis (CP) is a common inflammatory disease initiated by bacteria in a susceptible host that results in progressive loss of supporting structures around the teeth. The relationship between diabetes and periodontitis has been studied for many years and is generally agreed that the periodontal disease is more prevalent in diabetic patients compared to nondiabetic patients. Periodontitis is the sixth complication of diabetes; patients with poorly controlled diabetes have a major risk of developing periodontal disease, which will start as gingivitis gradually; if the glycemic control is deficient, this may progress to an advanced periodontitis. Moreover, diabetes and periodontitis seem to interact in a bidirectional manner.,,, The diabetic state impairs the gingival fibroblast synthesis of collagen and glycosaminoglycan, enhances crevicular fluid collagenolytic activity, and results in the loss of periodontal fibers, loss of the alveolar supporting bone, loosening, and finally, exfoliation of the teeth. The glucose-mediated advanced glycation end product accumulation would affect migration and phagocytic activity of mononuclear and polymorphonuclear phagocytic cells, resulting in the established of a more pathogenic subgingival flora. The maturation and gradual transformation of this subgingival microflora into an essentially Gram-negative flora will, in turn, constitute, through the ulcerated pocket epithelium, a chronic source of systemic challenge. This, in turn, triggers both an infection-mediated pathway of cytokine upregulation, especially with secretion of tumor necrosis factor-alpha and interleukin (IL)-1, and a state of insulin resistance, affecting glucose-utilizing pathways. It is accepted that the removal of periodontal pathogens can slow or arrest the progression of periodontitis by reducing local inflammation. The serum levels of inflammatory mediators that cause insulin resistance may be reduced through periodontal therapies, which may improve glycemic control. The conventional laboratory methods that are employed to screen for diabetes are time-consuming and necessitate elaborate equipment. The advent of blood glucose monitors allows the clinicians to assess blood glucose levels at the chairside, and results are obtained instantaneously in contrast to laboratory methods. This present study is intended to estimate the blood glucose levels from gingival crevicular blood (GCB) so that a noninvasive chairside estimation of blood glucose levels could be done. A previous study has demonstrated that nonsurgical therapy, for example, scaling and root planing (SRP) procedures causes improvement in periodontal health as measured by reductions in probing depth (PD), bleeding on probing (BOP), and gain in clinical attachment level (CAL). Lasers of various wavelengths have been proposed as alternative treatments for nonsurgical periodontal therapy. Systematic and literature reviews of the laser literature are consistent in noting that the evidence is inconsistent, and there is little support for using a laser as a monotherapy or adjunctive to SRP in the initial treatment of CP. 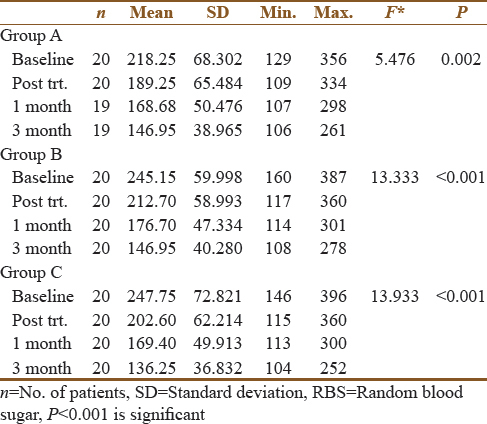 This present study is intended to estimate the random blood sugar level (RBS) levels from GCB and finger-prick blood (FPB) method so that a noninvasive chairside estimation of blood glucose levels can be done and to evaluate the effectiveness of SRP with the adjunctive use of diode laser (DL) and antibiotics in CP patients with diabetes. The randomized, double-blind, controlled trial was carried out from January 2017 to August 2017 in the Department of Periodontology. Ethical clearance was obtained for the study, all patients were explained about the procedure and importance of the treatment, and written consents were obtained from every patient before performing the test. A total of sixty patients were selected for the study after obtaining informed consent. There was almost no loss of participants during follow-up. To ensure an adequate power of 85%, the sample size was estimated as 60 for this study in which all the patients were CP individuals with diabetes. The patients were divided into three groups: Group A: 20 CP patients with diabetes treated with SRP, Group B: 20 CP patients with diabetes treated with SRP and antibiotics, and Group C: 20 CP patients with diabetes treated with SRP and DL [Figure 1]. Inclusion criteria were as follows: (1) patients with known history of diabetes with generalized CP diagnosed clinically with the presence of periodontal pockets and radiographically with bone loss, (2) patients aged 20–70 years, (3) no nonsteroidal or anti-inflammatory drugs within the past 6 months, (4) no history of periodontal treatment 6 months before the study, and (5) patients having ≥ 16 teeth. Exclusion criteria for all the three groups were as follows: (1) smokers and tobacco users, (2) aggressive periodontitis patients, (3) other systemic diseases such as heart diseases, rheumatoid arthritis, and hepatitis, (4) participants on any medication taken within the past 6 months which may alter the periodontal status, (5) hemolytic anemia or recent significant blood loss, and (6) pregnant and lactating mothers. Proper case history and data were collected from all the patients at baseline. Full-mouth periodontal examination, excluding third molars, was performed for all the patients. Assessment of the following clinical parameters such as gingival index (GI) (Loe and Silness, 1963), CAL, and probing pocket depth (PPD) was done at baseline, 1 month, and 3 months, respectively, by one trained periodontist. PD and CAL were measured using a probe at six sites per tooth (mesiobuccal/labial, midbuccal/labial, distobuccal/labial, mesiolingual, palatal, and midlingual/palatal) in all the teeth. The scores from the six areas of the tooth were added and then divided by six. Then, the indices for each of the teeth were added and then divided by the total number of teeth. Proper history was taken and data were recorded from the indices aided in confirming clinical diagnosis of CP with diabetes. RBS and GCB glucose level was also assessed. All sixty patients were examined intraorally for visual signs of periodontal inflammation. Areas with marked signs of inflammation were probed by a calibrated Williams probe, inserted into the gingival sulcus, as is commonly done during a periodontal examination. When the probe was removed, the gingival crevice was observed for bleeding. Bleeding gingival sites were determined with profuse BOP with access for the glucose self-monitoring device was chosen for testing GCB glucose. These areas were isolated with cotton rolls to prevent saliva contamination and dried with compressed air. Probing was repeated until sufficient amount of blood appears in the crevice. The selected areas were analyzed using glucometer (One Touch Select Simple, Johnson and Johnson, Mumbai India) according to manufacturers' instructions. The top edge of the reagent strip of glucometer was placed against the bleeding site. The blood was automatically drawn into reaction cell of the strip by capillary action until the confirmation window is full. The result of the test was displayed on the screen of the glucometer, after around 20 s, and the value was recorded. For the estimation of RBS level using FPB method, samples were taken preferably from the patient's nondominant hand. The soft-tissue surface of the fourth finger was wiped with surgical spirit, and the spirit was allowed to evaporate. Inserting the test strip into its slot turned on the glucometer. The surface of the finger was then punctured with a sterile lancet, and the drop of blood oozing was allowed to be drawn into the test area of the strip and was held until the glucometer gave a beep displaying the blood glucose level on the screen after 20 s, and the value was recorded. At baseline, all the data regarding RBS and GCB were documented including the clinical parameters such as GI, PPD, and CAL and were again recorded 1 month and 3 months after the treatment. SRP was performed in patients belonging to Group A. 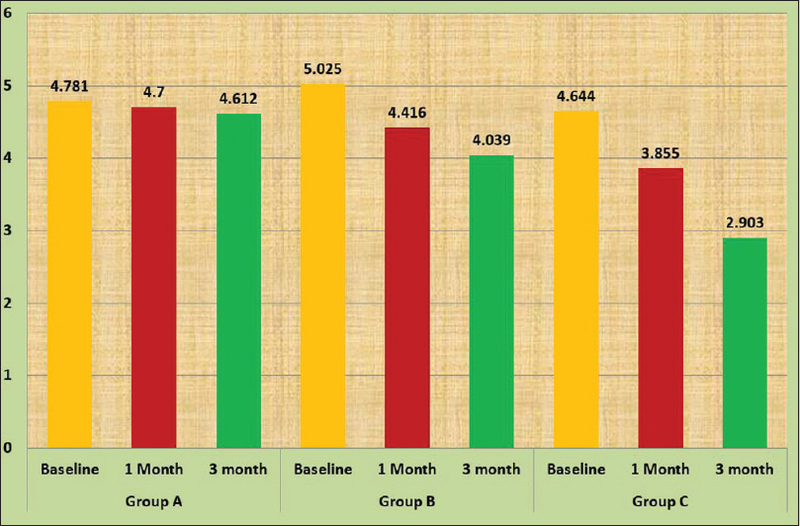 In Group B, SRP was performed combined with adjunctive use of amoxicillin (AMX) (Alkem, Bengaluru, India) plus metronidazole (MTZ) (Unique, Bhavnagar, Gujarat) therapy for 5 days. SRP was performed and DL (Zolar Technology and Mfg. Co. Inc., Mississauga, Ontario, Canada) was used for laser pocket therapy in patients belonging to Group C.
The data collected were entered in Microsoft Excel sheet and statistical analyses were performed using the Statistical Package for the Social Science (SPSS version 10.5) (IBM Corporation, Armonk, New York, United States) software. Mean age, GI, PPD, CAL, RBS, and GCB were calculated per group. One-way analyses of variance were used to test the difference between groups. Post hoc Tukey test was used to find out the difference of mean values between two groups. Student's t-test was used to determine whether there was a statistical difference between the groups in the parameters measured. Proportions were compared using Chi-square test of significance. In the above test, P < 0.05 was taken to be statistically significant. The age range of patients was between 28 and 70 years. Group A included 13 males and 7 females (53.0 ± 9.37 years), Group B included 15 males and 5 females (45.4 ± 9.66 years), and Group C included 17 males and 3 females (50.3 ± 9.77 years) [Table 1]. The pairwise comparison between the study groups showed significant reduction in the value of GI when compared at baseline, 1 month, and 3 months, and there were statistically significant reduction in GI for both Group B and Group C as compared with Group A [Table 2]. 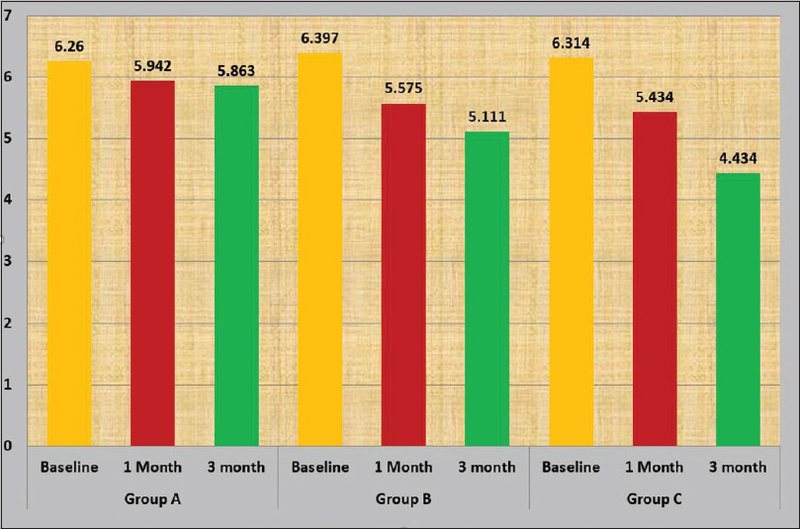 There was a significant reduction in both PD and gain in CAL from baseline to 3 months after the treatment in all the three groups, and Group C had maximum reduction in PD and CAL as compared to other two groups [Figure 2] and [Figure 3]. The GCB values of the study participants at baseline ranged between 98 and 388 mg/dl with a mean of 199.65 ± 74.77 (Group A), 138 and 369 mg/dl with a mean of 215.50 ± 61.67 (Group B), and 137 and 362 mg/dl with a mean of 209.60 ± 57.68 (Group C), and the GCB values were significant only in Group B and Group C at baseline, 1 month, and 3 months [Table 3]. The RBS readings for Group A at baseline ranged between 129 and 356 mg/dl (218.25 ± 68.3), 160 and 387 mg/dl (245.15 ± 59.99) for Group B, and 146 and 396 mg/dl (247.75 ± 72.82) for Group C. The RBS values were significant in all the three groups at baseline, 1 month, and 3 months [Table 4]. 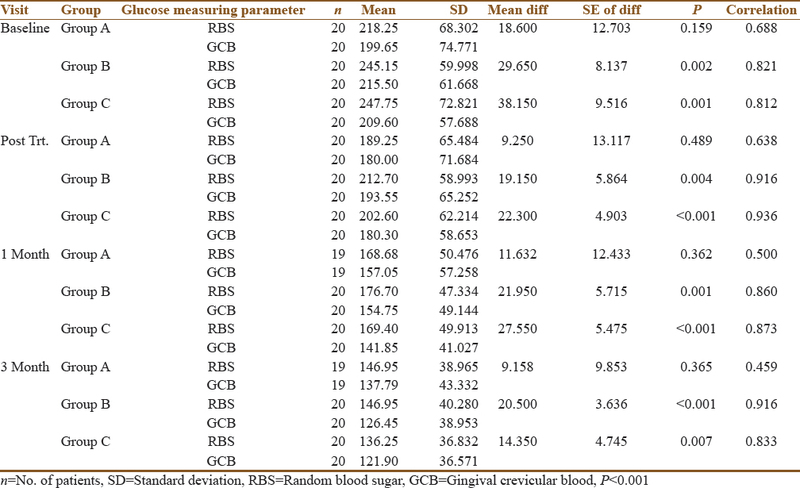 Comparison of blood glucose values obtained by GCB sampling and finger-prick method was performed [Table 5]. The data obtained from both these methods described in the methodology were statistically analyzed, and the data obtained from all the three groups have revealed a strong correlation in the posttreatment reduction of glucose levels in GCB and blood sample obtained using finger-prick method. Considerable efforts have been made in the past with regard to the development of painless and noninvasive methods to measure blood glucose level. The technique of using GCB is less traumatic and less time-consuming and does not cause any discomfort to the patient which may motivate dental professionals to implement diabetes screening using a GCB sample. The results of our study revealed a strong correlation between gingival crevicular and FPB glucose level measured. Another study evaluated whether blood oozing from gingival tissues during routine periodontal examination can be used for determining glucose levels. Other reported that 92% of the GCB glucose measurements were within 15% of the true glucose concentration. SRP alone or in association with antimicrobials yielded improvements in the periodontal condition of participants with diabetes and periodontitis. This study indicated that SRP + MTZ and AMX were more effective than treatment with SRP alone in reducing the clinical parameters as MTZ is quite effective in inhibiting certain strict anaerobes keystone pathogens and AMX in reducing total bacterial load. Another possible benefit of the combination of MTZ and AMX is suppression of the overgrowth of proteolytic pathogens that could benefit from tissue damage during SRP. Another study also showed similar results in reducing the clinical parameters using AMX plus MTZ therapy for patients with periodontitis and type 2 diabetes. The same study showed that the combination of MTZ + AMX produced greater beneficial changes in the subgingival microbiota, such as a significant reduction in the mean score, and the proportion of periodontal pathogens, such as Tannerella forsythia, Porphyromonas gingivalis, and Treponema denticola, and an increase in the proportion of beneficial species, especially blue and purple complexes (Actinomyces israelii, Actinomyces odontolyticus, and Veillonella parvula). Combining laser therapy with conventional procedures has achieved a more effective decontamination of the pocket, with also a recolonization slower than sites treated only mechanically. Some authors attribute this phenomenon to clot formation in the pocket that would act as a seal to it.,,,, A study was conducted to compare the effect of SRP alone and laser curettage as an adjunct to SRP on the clinical parameters of patients with periodontitis and controlled type 2 diabetes mellitus (DM) and concluded that, in both the groups, gingival inflammation was reduced and when laser curettage was used as an adjunct to SRP, more reduction in PPD and CAL was seen. DL therapy benefits the periodontium directly by eliminating the pathogens and disinfecting the pockets and indirectly by reducing the hyperinflammatory status and enhances the collagen formation, and thus, healing will be accelerated of DM patients. Another study aimed to investigate the effects of DL decontamination as an adjunct to nonsurgical periodontal treatment on the clinical periodontal parameters, gingival crevicular fluid IL-1 β, IL-6, and IL-8 levels, and metabolic control of type 2 DM patients with CP. SRP + DL treatments provided significant decrease in HbA1c levels in both poor- and well-controlled DM. Significant improvement was observed in PD and CAL measurements in all patients whereas improvement was significantly higher in SRP + DL in irregardless of metabolic control. IL-6 was significantly impacted by the adjunctive laser treatment in both well- and poor-controlled DM. DL therapy in conjunction with scaling and root planing kills the pathogens before they can enter the bloodstream. According to Goldstep DLs can provide a nonantibiotic therapy for patients. More studies need to be completed to show how DL therapy can replace antibiotic premedication treatments for patients. 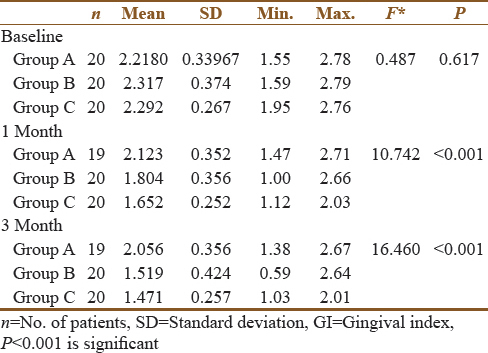 Although a strong correlation has been seen in the study between GCB and FPB glucose measurements, it is not the correlation of the whole group but instead the predictability of a single measurement on one patient. This is important because even a perfect correlation can have poor clinical significance for individual measurement. However, the precision must be considered to better weigh the values of individual measurements. In the present study, glycemic levels were monitored using RBS and GCB levels alone. It is known that measurement of hemoglobin A1c (HbA1c) levels is a reliable and nonfluctuant indirect test for serum glucose management that reflects or correlates with the average blood glucose levels during the past 3 months. Further studies using HbA1c levels as screening tools for assessing the association between SRP and hyperglycemia are needed. Second, the number of patients included in the study was 60 which could have been increased for more accurate results. The results show that DL treatment can provide better clinical results when it is used as an adjunct to nonsurgical periodontal treatment in CP patients with DM. Moreover, less invasive technique to measure patient's blood glucose level aids the periodontist to better assess the glycemic control which, in turn, contributes to the success of periodontal therapy. On the basis of the results of this study, GCB is a useful aid for testing blood glucose during routine periodontal therapy. Kornman KS. Mapping the pathogenesis of periodontitis: A new look. J Periodontol 2008;79:1560-8. Miller LS, Manwell MA, Newbold D, Reding ME, Rasheed A, Blodgett J, et al. The relationship between reduction in periodontal inflammation and diabetes control: A report of 9 cases. J Periodontol 1992;63:843-8. Lamster IB, Lalla E, Borgnakke WS, Taylor GW. The relationship between oral health and diabetes mellitus. J Am Dent Assoc 2008;139 Suppl 10:19S-24S. Harjit K, Sanjeev J, Shweta B. Minimal invasive chair side procedure for the estimation of glucose level using gingival crevicular blood. Indian J Dent Sci 2012;4:43-6. Li X, Kolltveit KM, Tronstad L, Olsen I. Systemic diseases caused by oral infection. Clin Microbiol Rev 2000;13:547-58. Bild DE, Selby JV, Sinnock P, Browner WS, Braveman P, Showstack JA, et al. Lower-extremity amputation in people with diabetes. Epidemiology and prevention. Diabetes Care 1989;12:24-31. Nguyen NT, Byarlay MR, Reinhardt RA, Marx DB, Meinberg TA, Kaldahl WB, et al. Adjunctive non-surgical therapy of inflamed periodontal pockets during maintenance therapy using diode laser: A randomized clinical trial. J Periodontol 2015;86:1133-40. Beikler T, Kuczek A, Petersilka G, Flemmig TF. 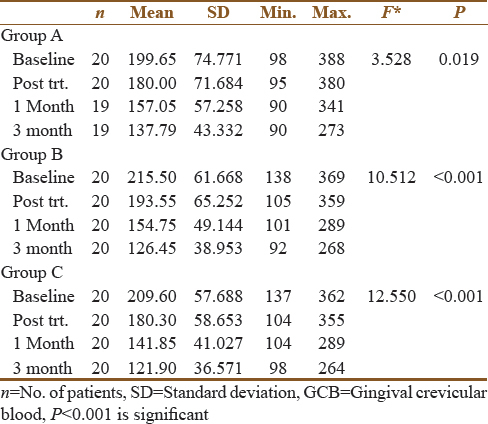 In-dental-office screening for diabetes mellitus using gingival crevicular blood. J Clin Periodontol 2002;29:216-8. Parker RC, Rapley JW, Isley W, Spencer P, Killoy WJ. Gingival crevicular blood for assessment of blood glucose in diabetic patients. J Periodontol 1993;64:666-72. Kiran M, Arpak N, Unsal E, Erdoğan MF. The effect of improved periodontal health on metabolic control in type 2 diabetes mellitus. J Clin Periodontol 2005;32:266-72. Tamashiro NS, Duarte PM, Miranda TS, Maciel SS, Figueiredo LC, Faveri M, et al. Amoxicillin plus metronidazole therapy for patients with periodontitis and type 2 diabetes: A 2-year randomized controlled trial. J Dent Res 2016;95:829-36. Matarazzo F, Figueiredo LC, Cruz SE, Faveri M, Feres M. Clinical and microbiological benefits of systemic metronidazole and amoxicillin in the treatment of smokers with chronic periodontitis: A randomized placebo-controlled study. J Clin Periodontol 2008;35:885-96. Bach G, Neckel C, Mall C, Krekeler G. Conventional versus laser-assisted therapy of periimplantitis: A five-year comparative study. Implant Dent 2000;9:247-51. Gregg RH 2nd, McCarthy DK. Eight-year retrospective review of laser periodontal therapy in private practice. Dent Today 2003;22:74-9. Moritz A, Schoop U, Goharkhay K, Schauer P, Doertbudak O, Wernisch J, et al. Treatment of periodontal pockets with a diode laser. Lasers Surg Med 1998;22:302-11. Saglam M, Kantarci A, Dundar N, Hakki SS. Clinical and biochemical effects of diode laser as an adjunct to nonsurgical treatment of chronic periodontitis: A randomized, controlled clinical trial. Lasers Med Sci 2014;29:37-46. Elavarasu S, Suthanthiran T, Thangavelu A, Mohandas L, Selvaraj S, Saravanan J, et al. LASER curettage as adjunct to SRP, compared to SRP alone, in patients with periodontitis and controlled type 2 diabetes mellitus: A comparative clinical study. J Pharm Bioallied Sci 2015;7:S636-42. Kocak E, Saglam M, Kayiş SA, Dundar N, Kebapçilar L, Loos BG, et al. 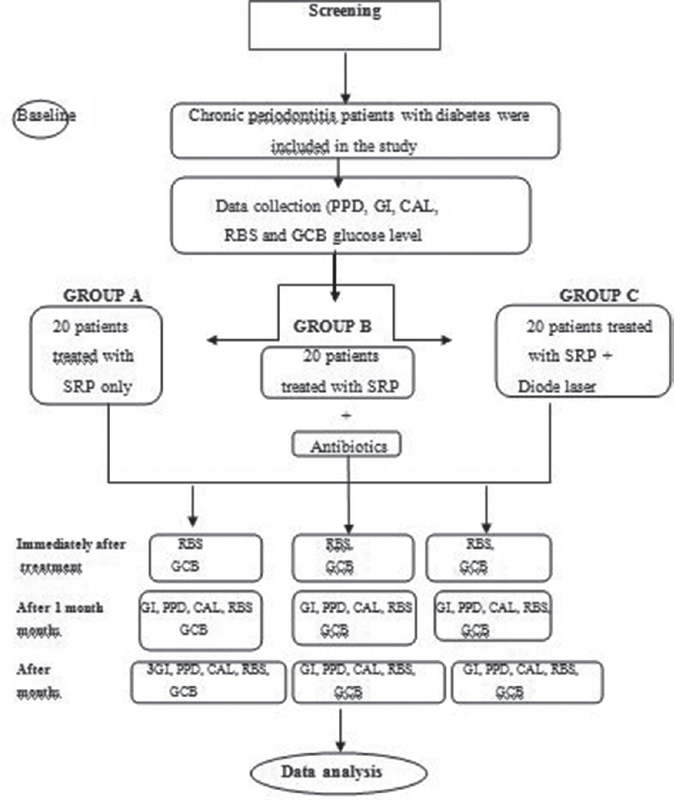 Nonsurgical periodontal therapy with/without diode laser modulates metabolic control of type 2 diabetics with periodontitis: a randomized clinical trial. Lasers Med Sci 2016;31:343-53. Goldstep F. Diode lasers for periodontal treatment: The story so far. Oral Health 2009;12:44-6.